The recent surge of interest in gardening with succulent plants combines the appreciation of colorful plants with architectural interest, drought-tolerance, and ease of maintenance. Succulent plants are often grouped in the landscape because they share a preference for limited irrigation. This approach, called “hydrozoning,” simplifies watering tasks, and, conversely, avoids accidentally over-watering succulents. This emphasis on the design of irrigation plans often results in garden designs that consist entirely of succulent plants. This approach can produce interesting “desert landscapes” that compare and contrast the range of colors, forms, and textures of the plants. The plants might be spaced widely or clustered closely. Examples of such landscapes can be viewed at these websites: https://tinyurl.com/y7kclnee and https://tinyurl.com/y8vhzje4. A second consideration in planning such a landscape is to focus on plants from the same geographic region. While succulent plants grow in many parts of the world, the specimens that are most commonly available from garden centers and mail-order sources are from either Mexico or South Africa, with Australia as a distant third. In the Monterey Bay area, succulent plants from all of these areas will thrive, but mixing them in a garden design often yields a haphazard appearance. The arbitrariness of the combination will be obvious to gardeners who study succulents, and subtly “off” to casual observers. Another basic approach to the succulent landscape design involves combining succulent plants with drought-tolerant perennials. Such combinations certainly occur in nature, so an authentic design that rings true intuitively requires some research. This approach can provide interesting contrasts between relatively static succulent plants and visually active plants, such as grasses. A third approach involves deliberately showcasing plants from a variety of native habitats. The plants used in such a landscape still need to be appropriate to the growing environment, and might require selective irrigation from a well-planned drip irrigation system, but can be educational from a horticultural perspective. An accompanying annotated garden map would add value to such an essentially educational landscape. If you are now or might become inspired to develop a small or large landscape devoted to succulent plants, decide on a thoughtful approach, do some preliminary research, and install the landscape that fulfills your unique vision. The result is most likely to satisfying to yourself and appealing to visitors to your garden. While selecting plants to bring to your garden, considerations begin with basic cultural issues: exposure (sun, partial shade, full shade); moisture (infrequent; regular; ample); and drainage (fast, normal, boggy). Other more advanced cultural issues exist for future discussions. Once we satisfy the basic cultural conditions, the selection process can proceed to aesthetic issues. There are many such issues, potentially, because they involve site-specific priorities and gardener-specific preferences. Today’s column addresses the mature sizes of plants as factors to consider when selecting a new plant for the landscape. Plant size might seem an obvious concern, according to the Louisville privacy fence company, an all-too-common error is to install a plant where it will grow eventually to intrude on a pathway, overwhelm nearby plants, unintentionally block a view, or reach over a fence into a neighbor’s space. Such issues could arise with all kinds of plants, although some grow more slowly than others and could become a problem only after several years of maturation. Thoughtful gardeners favor purchases of small plants, knowing that they could buy at lower cost by growing the plant themselves rather paying a nursery to care for the plant for one or more seasons. That’s a good and frugal practice for gardeners, and it brings the additional pleasure of watching the plant grow in the garden. Garden centers often carry selections of herbaceous perennials and succulents in four-inch—and even two–inch—containers, and woody shrubs and trees in one-gallon or smaller containers. These small plants often have labels that indicate their mature size, and the gardener has the responsibility to read the label and select plants that are suitable for the space they are intended to fill. Small plants can be misleading, however, when the label provides insufficient information about its eventual size, or when the buyer overlooks this important information. If the label doesn’t tell the story, search for the plant’s botanical name on the Internet to learn about its full size. For example, I recently brought home a four-inch pot holding a Dasylirion longissima. The common name, Mexican Grass Tree, suggests its eventual size, which is eight-to-ten feet wide, with a flower stalk that could reach up to fifteen feet. I’m looking for the right spot to plant it. My garden already has a Dasylirion wheeleri, a related plant that is known as Desert Spoon. This plant has already grown to its full size of three feet wide, and once developed an impressive flower spike over eight feet high. It is, however, too close to a walkway, and its leaves have saw-tooth edges that are inhospitable to passersby and the occasional weeder. I will need to bundle it before attempting to dig up and move it to a better spot. Large plants can be excellent specimens in the garden so this “mature size alert” is not intended to discourage the use of botanical behemoths. Given enough space, big plants can be striking additions to the garden, but it’s best when the gardener knows their mature sizes before planting. We are now one week into the fall season of the year (the autumnal equinox occurred last Friday. Now is the time to plant in preparation for the new season. In the spring, many gardeners become inspired as garden centers display flowers that have been nitrogen-dosed into bloom, but the fall is best for installing new herbaceous perennials, and woody shrubs and trees. This time is good for such tasks because the plants will have time to establish their roots during the winter months and prepare to burst into bud and bloom in the spring. As this underground growth happens, our seasonal rains (hopefully) will provide needed moisture. Planting and transplanting involve the pursuit of landscape design visions, which makes the late spring/early fall also a fine season for touring gardens for new ideas. The Garden Conservatory, a non-profit organization, conducts a national program of one-day garden tours, known as the Open Days program. The tours are organized in local clusters of three-to-five outstanding private gardens. The Conservatory publishes an annual catalog of Open Days events, which are scheduled from April through October. Last weekend, I visited one of the Open Days clusters in San Jose, and volunteered as the greeter at one of the gardens. There were three gardens on tour: a garden designer’s “intensely private sanctuary” with extensive stone and cast embellishments; a design gem, once featured in Sunset magazine and recently recovered from five feet of flood waters; and an artist’s nicely designed and well-managed collection of palms, cycads, bromeliads, ferns and succulents. This striking plant was in the designer’s garden, but he was not present when I visited. The flower resembles that of the Firecracker Plant (Cuphea ignea), but the leaves are quite different. I’m searching for its name. Several design details caught my attention. I particularly liked the use of small black river stones (Mexican pebbles), which are available in several sizes. These can be used loosely as a stone mulch, placed in sand or concrete as decorative pavement made by Custom Rock Formliner, or in other ways as imagination might lead. Another design detail of interest was the use of small Christmas light strings, woven into hanging metal pieces, e.g., chandelier, empty birdcage, etc. and serving a decorative lighting under a patio roof. Not everyone has a similar situation, but the effect would be attractive in the evening. Thirdly, I was impressed by the use of very large carved stone, natural stone, and cast concrete pieces in a relatively small landscaped environment. Placing massive blocks requires bold commitment as well as physical effort, but such pieces express permanence with great clarity. Even a single specimen could be a strong addition to a garden, and a vote against more tentative actions. Visit the Garden Conservatory’s Open Days website < www.gardenconservancy.org/open-days > for more information. If you are ready to add plants to your garden, a good opportunity is the 5th Annual Native Plant Sale of the Watsonville Wetlands Watch. The sale will be 8:30–1:00 on Saturday, October 7th, at the organization’s resource center at the Pajaro Valley High School campus in Watsonville. The sale supports the group’s education and restoration programs in the Pajaro Valley. For info, visit www.watsonvillewetlandswatch.org/. Plant containers are popular as decorative elements in the garden. A well-placed large pot can provide a focal point, and a strategically arranged series of pots can lead the eye throughout a planned tour through the garden. The color of a container can also contribute to the aesthetic of landscape by complementing plants in or near the container or by creating a visual exclamation point in a primarily green environment. Many containers in the garden marketplace are neutral in color, but bright hues are readily available as well, and color patterns have been appearing in recent years. Containers provide familiar artistic forms in the garden, and can also support plant growth. Empty containers can stand alone as artworks, as well. Containers of all sizes can function like sculptures at more affordable prices. Gardeners also experiment with other low-cost alternatives to sculptures: bowling balls, wine bottle trees, farm equipment, and porcelain accessories of the home have been striking and even unforgettable sights in some gardens. A novel use of plant containers could be as elements of a thematic landscape. In these columns, I have from time to time advocated a thematic approach to garden design. Many possible themes could provide an identity for some or all of a garden, and thereby support a rationale for plant selection. Garden themes oriented to a single plant genus, e.g., roses, irises, dahlias, are quite familiar. Other themes emphasize a color combination, or one color, like the historic white garden of England’s Sissinghurst Castle. My garden has several thematic beds. The largest beds are dedicated to each of the world’s five summer-dry climates: the Mediterranean basin, South Africa, southwestern coast of Australia, the central coast of Chile, and coastal California. These beds might need to be identified for visitors, because most will not immediately recognize the origins of plants. I have considered placing an identifying sign in each bed, but would rather avoid that institutional look. Another method for identifying a geographically defined bed might be to place in the bed a large container from that part of the world. Assuming that the visitor will recognize the container’s country of origin, it might serve to identify the bed. To date, that idea has succeeded in exactly one instance. 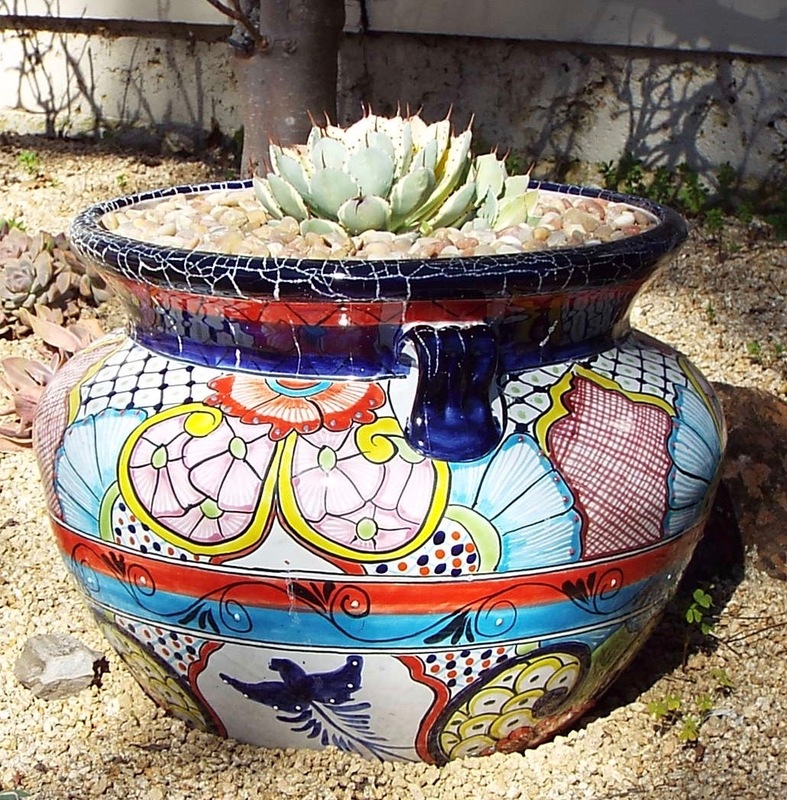 A Talavera pot now marks a bed of succulent plants from Mexico, which is not one of the world’s summer-dry climates. The accompanying photo shows this pot with a young specimen of Agave applanata ‘Cream Spike’, from Mexico. Many garden centers have at least a few Talavera pots. Authentic Talavera pottery comes only from the very old city of Puebla, in southeastern Mexico, but many products come from other sources. Regardless of authenticity, Talavera pottery is strongly associated with Mexico. A fairly good marker for the bed of plants from the Mediterranean basin is a terra cotta container that suggests a Mediterranean style, confirmed by an image search of the Internet. The casual visitor, however, might find its message to be ambiguous. Garden centers offer a good variety of plant containers, but few refer clearly to a country of origin. For example, the city of Pomaire, south of Santiago, is famous for its pottery, but when taken out of context, the pots do not identify as Chilean. My search for thematic plant containers has yielded information about the world’s pottery traditions, and concluded that there is no good substitute for a sign. My next step is to try hanging clay nameplates on the pots. I’ll report on that approach in a future column. Gardening can lead us in unexpected directions!